You are at:Home»Life»Community»Local News»The REAL London Loft Has Moved! You know you’ve been in China too long when the story of a Chinese person going into business with a foreigner cues a similar end in your mind before you’ve even heard the story’s conclusion. People and business models differ, but the results are often the same: The foreigner gets pushed out. The business continues without the foreigner but doesn’t give up the name. The foreigner has no recourse. 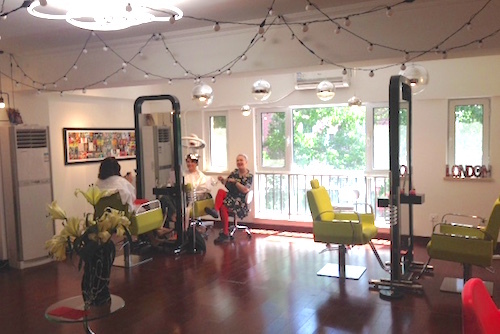 Details in the case of The London Loft hair-styling salon are slightly different, but the result is not: now there are TWO locations with the same name, but only one features the stylist Scarlet Salmons and colourist Phoebe Gao. Be sure you don’t get fooled! I’m not generalizing, because there are success stories with long-term business relationships, but stories of foreign business owners being pushed out of the business partnerships and then finding themselves with very limited legal recourse are so plentiful that it’s become the norm not the anomaly. Remember the restaurant “Salt,” for instance, in Lido? Similar story. Or, what about the Wudaoying (五道营) American-style vegan restaurant “The Veggie Table” that is now no longer associated with its American founder? Then there’s Divina Cakes, an online Italian bakery which currently has no one in charge that even speaks Italian, let alone is from overseas. When I heard that Scarlet, (a hip British stylist who has been in Beijing for over a decade but whom I only discovered last year), was moving locations from her recently established London Loft salon to “just up the road,” I had a feeling something was up. Disputes with the previous tenants of the old salon space left them no option but to leave, but the remaining (previous) tenants refused to remove the signage or re-brand the location upon their departure. Local police offered no support. The only option left for London Loft is to exist just “up the road” and advertise as clearly as possible that “the real London Loft has moved”! Personally, I prefer the new space. While it’s just an office building from the outside, and seems a bit more hidden, the new location is brighter and sunnier; it seems to “breathe” more easily. I suppose that is exactly what happens when one is released from a bad business situation, though! Last year, I wrote this article about The London Loft when it first opened. This article cites the old location—BEWARE! It has moved! Local Australian artist, Moo, created these great posters to help Scarlet and Phoebe spread the word, but ultimately it’s all about word of mouth in this expat community. Please tell your friends. Keep going to support these ladies who are both truly exceptional at what they do. Whatever you do, don’t make the mistake of going to the old location where, aside from identical signage, no one with the same abilities or keen eye for style will be standing behind your head wielding sharp scissors. Does anyone know how to reach them to make an appt with Phoebe?? I’ll double check with someone on that number, then! I went and had a great experience – I recommend LL! Phoebe’s wechat ID, BTW, is 15810419753. And the london_loft one works, too.